A Population III during its main sequence heating and ionizing the surrounding 3 kpc. Big Bang nucleosynthesis only produced hydrogen and helium with a trace amount of lithium. Every other element in the present day were created within stars and their supernova explosions. However, what were the properties of the first generation stars in the universe? What were the impacts (aka “feedback”) on their surroundings? Computer simulations in the last decade have demonstrated that they are very massive, between 10 and 200 times the mass of the Sun. In turn, they burn their nuclear fuel tremendously fast and live for only several million years, producing a luminosity that can be 1 million times greater than the Sun. 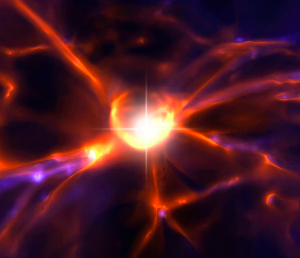 We follow the formation of the first stars in the universe in various different environments. After the star is born, we can follow the growth of the ionized and heated bubble by solving the radiative transfer equation in our simulation. A fraction of Population III stars end their lives with supernovae, enriching the universe from a pristine mix of hydrogen and helium with heavier elements. These explosions are accurately modeled in our simulations, and we explore the consequences they have on subsequent star and galaxy formation.